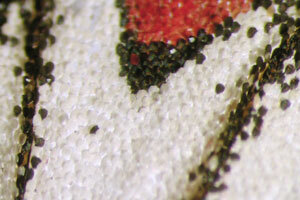 A compound microscope is a microscope that uses multiple lenses to enlarge the image of a sample. Typically, a compound microscope is used for viewing samples at high magnification (40 - 1000x), which is achieved by the combined effect of two sets of lenses: the ocular lens (in the eyepiece) and the objective lenses (close to the sample). The total magnification is calculated by multiplying the magnification of the ocular lens by the magnification of the objective lens. Light is passed through the sample (called transmitted light illumination). Larger objects need to be sliced to allow this to happen efficiently. Compound microscopes usually include exchangeable objective lenses with different magnifications (e.g 4x, 10x, 40x and 60x), mounted on a turret, to adjust the magnification. These microscopes also include a condenser lens and iris diaphragm, which are important for regulating how light hits the sample. 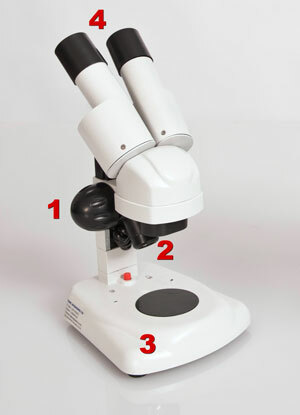 The stereo- or dissecting microscope is an optical microscope variant designed for observation with low magnification (2 - 100x) using incident light illumination (light reflected off the surface of the sample is observed by the user), although it can also be combined with transmitted light in some instruments. It uses two separate optical paths with two objectives and two eyepieces to provide slightly different viewing angles to the left and right eyes. In this way it allows a three-dimensional visualization of the sample. Depth of field is the distance between the nearest and farthest points in a sample that appear sharp in the viewed image. Many stereomicroscopes also have adjustable magnification. 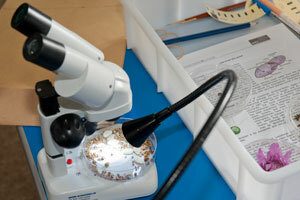 The stereomicroscope should not be confused with a binocular compound microscope, which has double eyepieces. 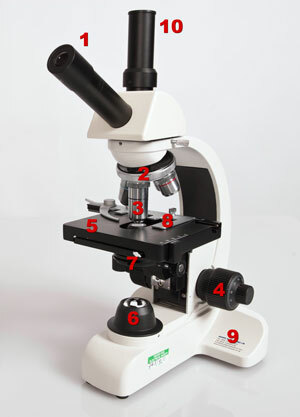 The image in such a binocular compound microscope is no different from that obtained with a single monocular eyepiece. 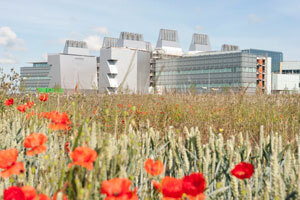 Learn about the research microscopes scientists use here.